How Does A Madman Erase A CD? With a lot of voltage. That’s how some dude in the UK went about testing his new toy. Basically an innocent CD is placed between two electrodes and at the flick of a switch–Bzzzzzzzzzzzz. 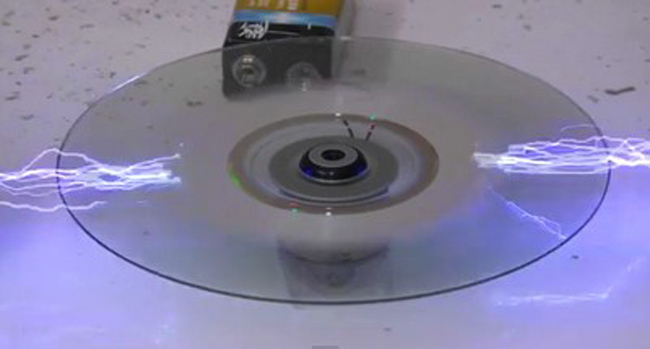 A powerful electric current shreds the CDs aluminum layer in a matter of seconds. Below is a screenshot from a vid posted on Youtube by Mr. Photonicinduction. Alright boys and girls, this is how you erase a CD. What follows next is what could be described as e-waste snuff. It’s grisly stuff but kinda alluring as well.